During what the Chicago Board of Election Commissioners says has otherwise been “an exceptionally quiet day,” it is investigating an alleged assault on a campaign worker committed by the supporter of a political rival. In a video posted on Facebook, Deborah Foster-Bonner, an aldermanic candidate for the city’s 6th Ward, alleges the field coordinator for her opponent, incumbent Ald. Roderick Sawyer, assaulted her son Malcolm at the Hamilton Park polling place at 413 W. 72nd St.
Election board spokesman Jim Allen says investigators are speaking with witnesses and working to confirm the identity of the alleged assailant. 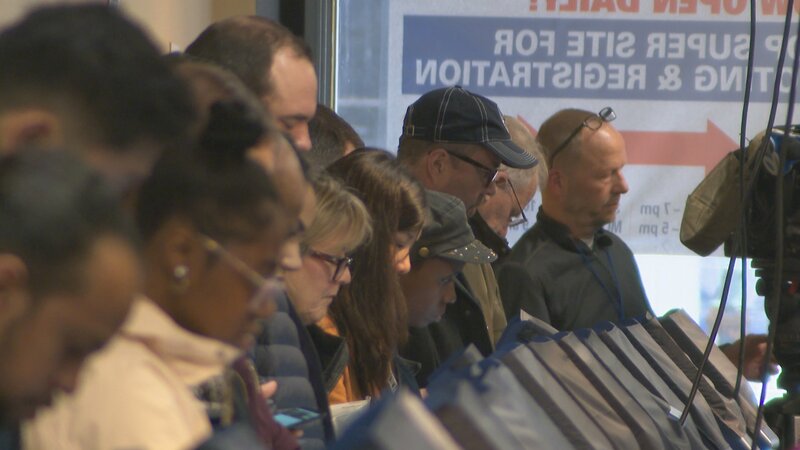 As of 3:25 p.m. Tuesday, more than 370,000 Chicago residents had cast their ballots for the city’s next mayor, treasurer and, in some wards, alderman. The election board says that with just over 23 percent voter turnout, the runoff is on pace to have a similar turnout as Chicago’s Feb. 26 election, in which voters whittled the mayoral field of candidates from 14 to two: former federal prosecutor Lori Lightfoot and Cook County Board President Toni Preckwinkle. Allen says early voting and vote-by-mail numbers are almost identical in the runoff election, with voters making up their minds much sooner than they did in February. “So, the numbers in early voting were very consistent day-to-day in [this] runoff election, whereas we had nothing until the last five-to-six days of early voting [in February],” Allen said. Similarly, there were very few vote-by-mail applications returned until the days just before and after the Feb. 26 election, he said. “This time, 62 percent of vote-by-mail applicants have returned their ballots. It’s clearly a lot easier for people to make up their minds in this round,” he said. Early voting surged on Monday, with 17,850 people casting ballots, bringing early voting totals to 122,829. The election board says that number is close to the total number of early votes cast in the February election, but still about 19,000 fewer votes than during early voting in the April 2015 runoff election between Mayor Rahm Emanuel and then-Cook County Commissioner Jesus “Chuy” Garcia. Allen says that millennial voters, those ages 25 to 44 years old, make up the two largest voting blocks in the city, but voters ages 55 to 74 are voting in larger numbers, whether in person, by mail or through early voting. Aside from the alleged assault in the 6th Ward, the only other voting problem of note happened in the 39th Ward, where an election coordinator arrived to open voting in precinct 27 to find there were no judges on site. The board was able to gather a substitute judge from a nearby precinct, and two standby judges. Allen says those voters who were turned away early have been contacted and all will be able to cast their ballots before polls close at 7 p.m. Thus, there is no need to ask the court to extend the voting hours. “It’s been very smooth,” he said. How Will Runoff Election Results Impact Chicago Politics?